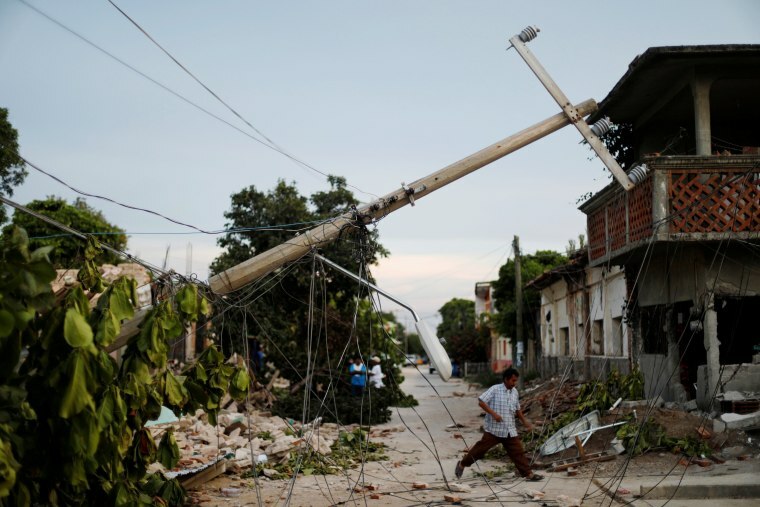 JUCHITAN, Mexico — The death toll from one of the most powerful earthquakes ever recorded in Mexico rose to at least 61 early Saturday as workers scrambled to respond to the destruction just as Hurricane Katia struck its coastline. The 8.1 quake off the southern Pacific coast just before midnight Thursday toppled hundreds of buildings in several states. Hardest-hit was Juchitan, Oaxaca, where 36 people died and a third of the city's homes collapsed or were otherwise rendered uninhabitable, President Enrique Pena Nieto said late Friday in an interview with the Televisa news network. The U.S. National Hurricane Center reported Katia's maximum sustained winds had dropped to 75 mph, making it a Category 1 storm when it made landfall. And it rapidly weakened even further over land into a tropical storm. The center said Katia was expected to dissipate over the course of Saturday. But it was still expected to bring life-threatening floods and storm surge off the Gulf of Mexico, though the extent of the storm's impact was unclear in the dark of night. Pena Nieto announced that the earthquake killed 45 people in Oaxaca state, 12 in Chiapas and 4 in Tabasco, and he declared three days of national mourning. The toll included 36 dead in Juchitan, located on the narrow waist of Oaxaca known as the Isthmus, where a hospital and about half the city hall also collapsed into rubble. Rescuers searched for survivors Friday with sniffer dogs and used heavy machinery at the main square to pull rubble away from city hall, where a missing municipal police officer was believed to be inside. The city's civil defense coordinator, Jose Antonio Marin Lopez, said similar searches had been going on all over the area since the previous night. The earthquake also jolted the Mexican capital, which largely lies atop a former lakebed where the soil is known to amplify seismic waves. Memories are still fresh for many of a catastrophic quake that killed thousands and devastated large parts of the city in 1985. The latest earthquake swayed buildings and monuments in the capital more than 650 miles from the epicenter. The quake's power was equal to Mexico's strongest in the past century, and it was slightly stronger than the 1985 quake, the U.S. Geological Survey said. However its impact was blunted somewhat by the fact that it struck some 100 miles offshore. The quake triggered tsunami warnings and some high waves, but there was no major damage from the sea. Authorities briefly evacuated a few residents of coastal Tonala and Puerto Madero because of the warning.